Chef Marc Meurin holds two Michelin stars for his restaurant Le Meurin at Busnes in northern France. Today I’m one of half a dozen people, all from the United Kingdom, that he greets and welcomes into his kitchen to participate in a cookery class. Disclosure: Stuart Forster, the author of this post, travelled to France and participated in the cookery class as a guest of Pas de Calais Tourisme and retained full editorial control of this post. Neither Pas de Calais Tourisme nor Le Meurin reviewed or approved this article. We weave between Le Meurin’s stainless steel work surfaces then gather round a cooking station. Mathieu Boutroy, one of the restaurant’s executive chefs, introduces himself and Sebastian, who’ll be assisting. Matheiu will be doing most of the talking today, otherwise everything will have to run through a translator. Unfortunately, my understanding of the French language is too limited to participate in a cookery class without translation. He explains that we’ll be learning how to cook three of the dishes that are associated with Le Meurin: carpaccio of scallop, white leeks with smoked salmon plus poached foie gras with beetroot cream. Foie gras served with poached beetroot. The scallops served at Le Meurin are sourced locally, from northern France. We hear that for every kilo purchased the restaurant receives approximately five scallops. The restaurant sources its principal ingredients from local producers who are specialists in their field. “The prices for mushrooms, truffles and scallops are expensive but the quality is very high. A regular customer can’t understand why we buy asparagus for around 40 euros a kilogram. Only the two Michelin-starred or three Michelin-starred chef buys this type of produce,” explains Matheiu. We hear that the local scallop season starts at the beginning of October and continues until the end of April or beginning of May, depending on the weather. “You cannot eat scallops in summer — only frozen ones. If you see them on the menu of a restaurant in August you have to change! Choose another restaurant,” jokes Matheiu as he opens a scallop and holds it up for the group to see. “When you buy scallops you need to buy live scallops,” he encourages and points to the raggy bits that surround the white meaty flesh. “We call this la barbe, meaning ‘the beard’. From this you can cook a very good sauce,” he explains. Preparing scallops in the kitchen of Le Meurin. “The speciality of French cuisine is that each time we cook produce we make a sauce or jus from some part of it. From scallops we make a sauce from la barbe. If I was cooking fish, I would use the bones to make a stock for a sauce,” says Mathieu while Monsieur Meurin looks on at his work. We observe how to open a shell and follow the scallop’s shape with a knife. Mathieu then demonstrates how to cleanly scoop the white meat of the scallop from the shell using just a spoon. He separates and discards the yellow part — the coral — which he says never eats and recoils in mock horror when one of the group says that he uses it regularly. We learn how it’s important to wash scallops twice. The first time they should be washed then placed on a towel and left for five minutes. The second time they are rinsed under running water, in case there’s any sand left on them. A plate of carpaccio of scallop is ready to serve. Carpaccio of scallop has been a seasonal feature on Le Meurin’s menu since the late-1990s. We then receive a pro tip for slicing scallops. Placing them in a freezer for 15 to 20 minutes, in order to cool, makes them easier to cut. It helps push the individual scallops together so that pieces two to three millimetres thick can be sliced. Simple but highly effective. Marc Meurin at work in the kitchen of Le Meurin. The sauce for the carpaccio of scallop starts with a spoonful of honey and lime juice. Salt and pepper are added early so that they dissolve in the acidity, something that Mathieu emphasises before whisking the mixture in stainless steel bowl. Then comes calamansi vinegar, from the Philippines — which is citrussy, like a cross between sweet lime and orange — followed by white balsamic vinegar. A gentle black olive oil — significantly lighter than regular olive oil — is then whisked into the mixture. Roasted sesame seeds, Szechuan pepper and ground coriander are added to the sauce before it’s poured over the thinly sliced scallops. Caviar lime — an ingredient from Australia that’s sometimes known as finger lime and reveals translucent green pearls when sliced — adds a crunchy texture and another level of flavour to the dish. The slices of scallop marinade for just two or three minutes before they are ready to serve. The result is a delicious starter that elicits wows of appreciation from those of us participating in the cooking class. It’s a dish that I like the idea of preparing at home. 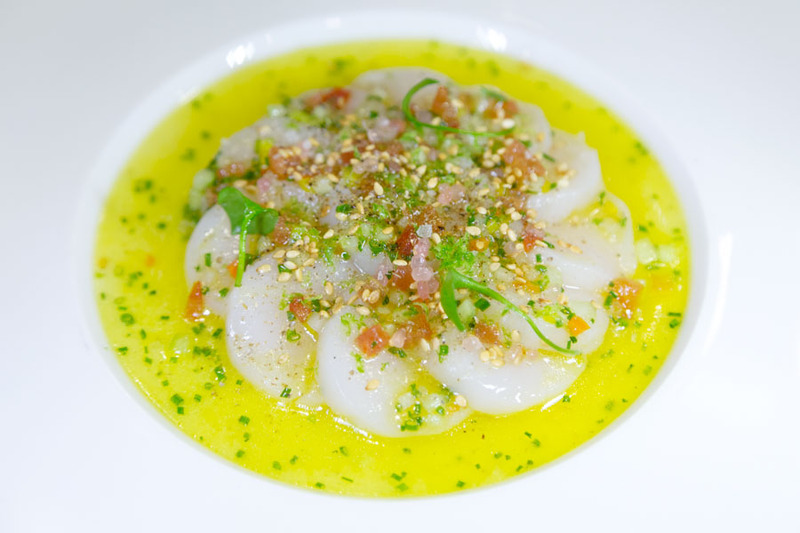 Carpaccio of scallop served in a tangy sauce featuring lime juice and olive oil. Mathieu and Sebastian then start to show us how to prepare white leeks with smoked salmon. “It’s another famous recipe of Monsieur Meurin. It can be prepared in just 10 minutes. It’s something really tasty that you can prepare if someone unexpected comes to your house,” says Mathieu. He starts by melting butter in a pan, for braising the chopped leek. He freshly squeezed orange juice and salt and white pepper. I’m impressed by his deft wrist flicks to flip the ingredients of the pan. He then mixes in soured cream and thin slices of smoked salmon. I notice that none of the recipes we’re learning involve following listed weights or volumes of ingredients. It’s much more about tasting while cooking and adding an appropriate amount according to intuition and taste. Quick and easy – white leeks with smoked salmon. As the demonstration continues and the foie gras is being prepared, I turn to Monsieur Meurin. Via a translator I hear how he enjoys trying food while travelling. He explains that many people visit Le Meurin for real, classical cuisine though the amount of sugar in the desserts is being reduced. So too is the amount of fat in the dishes. I learn that the process of experimenting on new produce is collaborative. It involves several of Le Meurin’s staff and Monsieur Meurin’s wife, who he says has a good palette and tastes the dishes. Ultimately all new dishes being added to the menu involve a team of people sitting together to reach a decision. He tells us how he is the eldest of a family of four children from Lens. After returning home from school on an evening he saw his mother cooking and helped. That was how he began cooking. Aged around 14 he passed an exam to go to catering school. His parents had two gardens and practically everything they cooked came from them. I ask if he could cook for anyone who would it be, I ask. He answers that he loves cooking for people who have not previously tested gastronomic cooking. Rather than a VIP, he’d rather cook for his neighbour. As the cookery class comes to a close Monsieur Meurin beams us a smile and says “it will be a pleasure for me to cook for you tonight.” I look forward to the experience of dining at Le Meurin. Chef Marc Meurin and his team during a cookery lesson. Marc Meurin and his team run cookery classes in the kitchen of Le Meurin on Saturday mornings, beginning at 9.30am. The class is followed by lunch in the dining room of Le Jardin d’Alice, the brasserie restaurant at the Château de Beaulieu (1098 Rue de Lilliers, 62350 Busnes, France; tel. +33 (0)3 2168 8888). Booking is essential. Check the Château de Beaulieu website for information about the theme, availability and price of the class. Find out more about things to see and do in the region around Busnes on the Pas de Calais Tourisme website. The France website also has information about the region. The photographs illustrating this post are by Why Eye Photography, based in the north-east of England. Call 07947 587136 to discuss your photography requirements and make a booking. Pin this for later! Marc Meurin in the kitchen of Le Meurin, the two-starred Michelin gourmet restaurant, at the Château de Beaulieu, a 4-star Relais & Châteaux hotel, in Busnes, France.